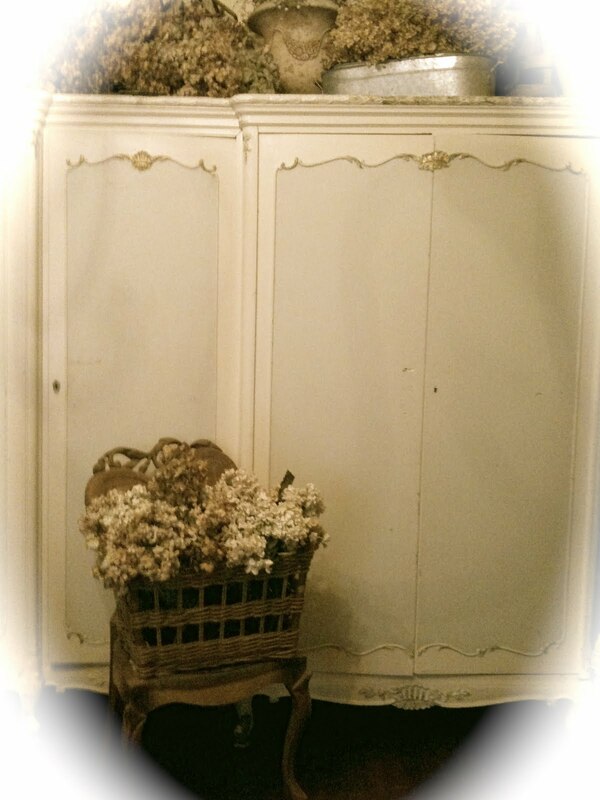 I love this wardrobe armoire. Creamy, soft colors & it's elegant french lines. not from sandpaper and sweat. something to hide the television in. 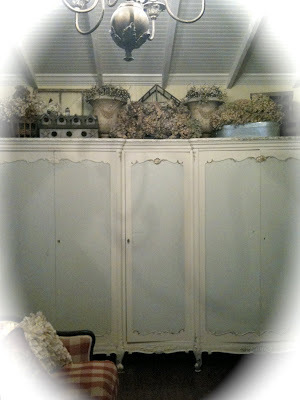 Meandering around the store, there were so many armoires. Each one was beautiful- and perfectly restored or finished. 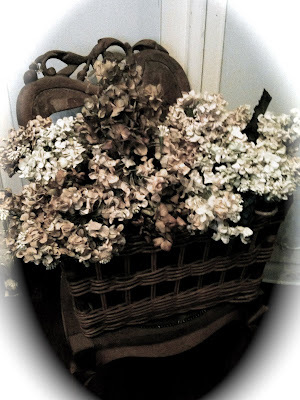 I wanted painted, shabby & loved. a large (nearly 9' long!) wardrobe armoire with no doors on it. Stately & elegant & painted & shabby. 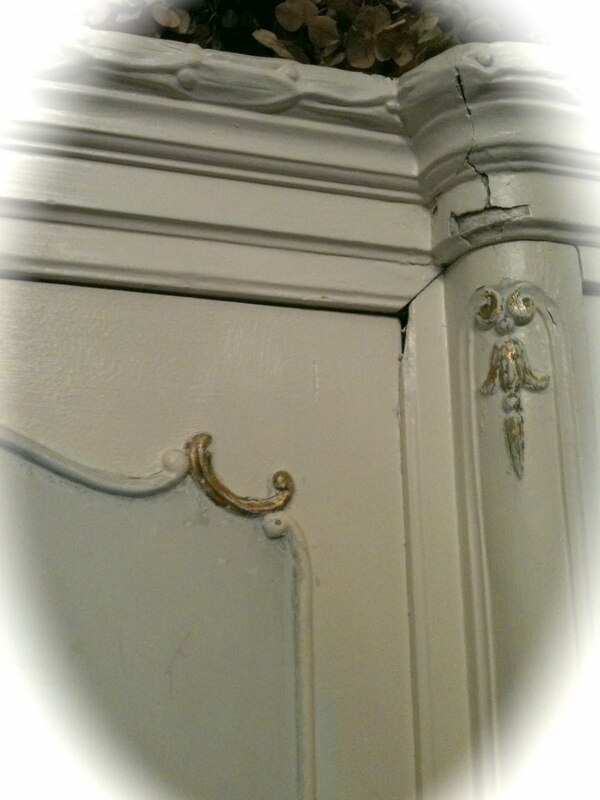 and thick carved moulding on top. 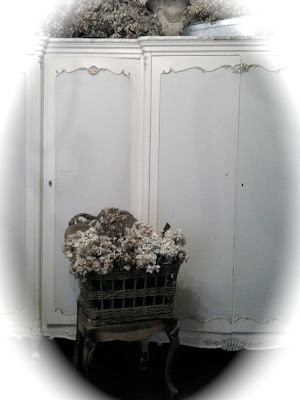 mimicking a high end armoire in a magazine. Fortunately, she had not gotten too far yet and she brought them over for me. a fresh coat of paint would fix it. 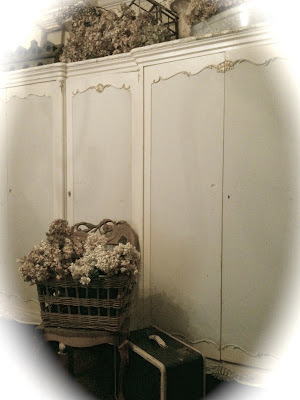 in all it's faded blue and white gilded glory. the more in love I was! but the doors are the back to the original finish. the dark wood finishes mixed with the chipped paints. Courtney, that piece is gorgeous! Courtney! Your armoire is stunning...and so is your bedroom. I love the ceilings. Wow. Can you give us a tour of your bedroom? Courtney, that is beautiful and perfect!!! I love it too and am slightly jealous, but more so happy that you have it!!! What a beauty! so happy for you! I love how you've dressed the top! Yes that is a treasure. I love it too Courtney! Wish I could rip our my closets and have this beauty instead. That is such a stunning statement piece! It's breathtaking and I'm sure your heart goes pitter-patter every time you walk in the room. What a beautiful piece Courtney! I need to take you shopping with me since you always find such wonderful goodies! This is a gorgeous piece, Courtney. You did good. It's so pretty, so you! The color is perfect what a perfect spot for a tv! love it! i gave you an award! Gorgeous, I love how soft the colors are. Beautiful. I just love, love your blog...how pretty it is. I get the feeling we have a lot in common. I have a degree in Interior Design and getting ready to open a little boutique of my own. Your blog is wonderful, I'm so happy I found it tonight. If you get the time please stop by my blog and visit, I am planning a big give away in just a few days.. I will be by often to visit. What a find indeed! How wonderful that she had the doors! Just gorgeous. Thanks for stopping by my blog tonight! Wow! I have never seen anything like that before. It is stunning! You did a great job retoring it, looks amazing! Lucky you, finding something that suits your style so PERFECTLY! You must have felt like floating all the way home after finding it!! Thanks, Courtney for linking this up this week! What a wonderful surprise, finding the original finish! That shade of delicate blue is so very French and perfect. Really beautiful. I love the soft blue on the doors and the overall effect. It is so feminine and romantic. Gorgeous! 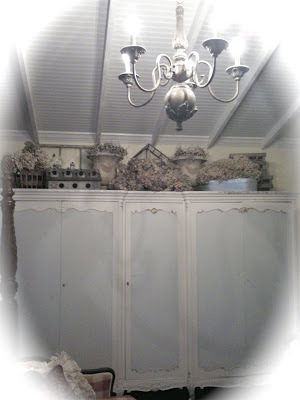 My bedroom armoire is on my to do list! Thanks for the inspiration, Courtney! What a treasure! 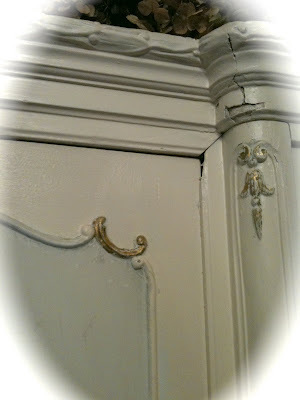 I so love the dainty scrolls on such a large armoire. And the color is perfect! Hey lady! Just coming back by to say thanks for linking this up to the Party this week! Wow, this is fabulous!! 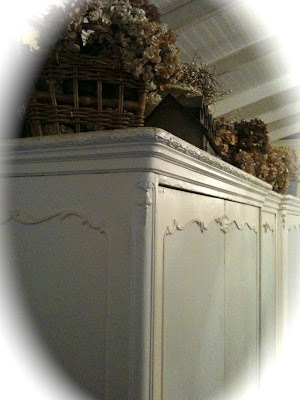 Love the colors and that shabby French feel! Thanks so much for linking up! 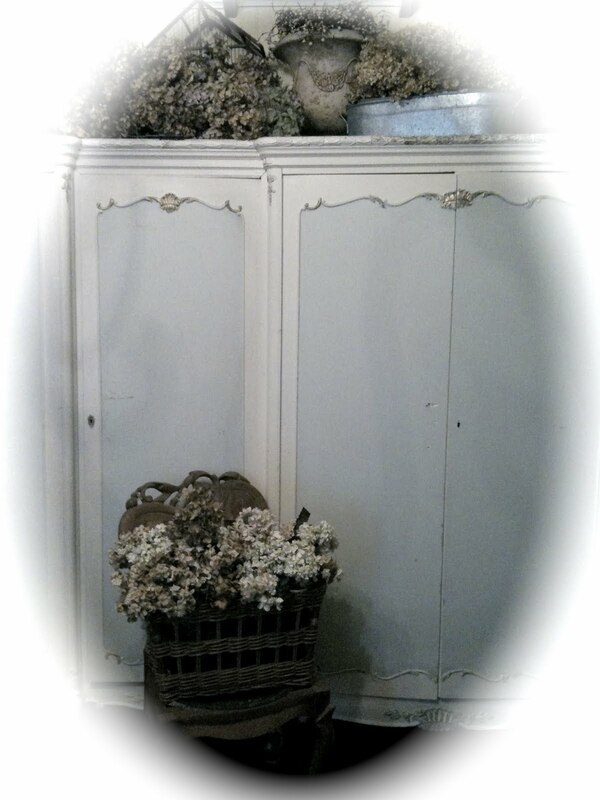 That is one GORGEOUS armoire! You did a fabulous job with the finish. Its so perfect in its space. What an awesome find Courtney! I love the simplicity of the color with all that scrolling detail. Your bedroom must be huge to be able to fit that in! Love the ceilings too. This is a jewel of a piece! I have been looking for the right thing to hide the TV in that will work in my very French living room. This would be perfect, so I will keep my eye out for something similar around! I found you through Frenchy...I'm your newest follower! Thank you so much for linking up ! This is gorgeous !